Make a day of it! Come and see our patients, then enjoy your packed lunch on Rodeo Beach and hike around the beautiful Marin Headlands. Driving directions, a map and public transport options are listed below. See you soon! From North of the Golden Gate Bridge: Take the last Sausalito exit off Highway 101, just before the Golden Gate Bridge. At the exit stop sign, turn right and go under the freeway, then follow the road down to the left. Within 300 feet you see a left turn signposted to the Marin Headlands (this is the only available left turn before you begin the descent into Sausalito). You should see a tunnel with a five-minute light. Proceed through the tunnel. Follow directions below. From South of the Golden Gate Bridge: Just after you cross the Golden Gate Bridge, take the second exit off Highway 101 at Alexander Avenue (after the Vista Point). Within 100 feet you see a left turn onto Sausalito Lateral road (it is very poorly labeled, but this is the only available left turn before you begin down the hill into Sausalito). You should see a tunnel with a five-minute light. Proceed straight through the tunnel. Follow directions below. From North of the Golden Gate Bridge: Take the last Sausalito exit off Highway 101, just before the Golden Gate Bridge. At the exit stop sign, turn left and then immediately right onto Conzelman Road (up the hill). Continue winding up and around the Marin Headlands, passing a number of historic military batteries along the way. After one mile you will come to a traffic roundabout, where you will take the first turn-off to the right. This is McCullough Road, which you will take down the hill to Bunker Road. Turn left onto Bunker Road and follow the directions below. From South of the Golden Gate Bridge: Just after you cross the Golden Gate Bridge, take the second exit off Highway 101 at Alexander Avenue (after the Vista Point). At the bottom of the exit ramp, turn left to go under the freeway. On the other side of the freeway, turn right onto Conzelman Road (up the hill). Continue winding up and around the Marin Headlands, passing a number of historic military batteries along the way. After one mile you will come to a traffic roundabout, where you will take the first turn-off to the right. This is McCullough Road, which you will take down the hill to Bunker Road. Turn left onto Bunker Road and follow the directions below. Follow Bunker Road for approximately 2.5 miles. Follow various forks to the right; make sure you stay on Bunker Road and then you will see Rodeo Lagoon on your left. Follow the road with the lagoon on your left until you reach a stop sign and the road forks. Turn right at that fork, continuing uphill. Turn right at your next opportunity, which is signposted The Marine Mammal Center. Head up the hill towards our hospital and parking lot. On Saturdays and Sundays throughout the year, there is public transportation to the Marin Headlands using the MUNI 76X Marin Headlands Express. It ends at Rodeo Beach, a pleasant 10-15 minute walk to our facility. Click here for the 76X Marin Headlands Express schedule. Unfortunately, there is no daily public transportation to our facility on weekdays. The Sausalito ferry arrives in downtown Sausalito, six miles from our site. There is no public transportation to our facility from the ferry terminal, but there is a taxi stand located there. Consider prearranging both inbound and outbound travel with your driver, as long wait times are to be expected for taxis returning to the Marin Headlands. Click here for printer friendly version of these directions and map. 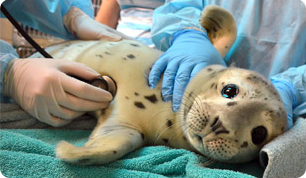 Visit The Marine Mammal Center!